If you would like to attend, please register for the conference by clicking here. Dr. Mimi Masson is part-time professor at the University of Ottawa. Her teaching career spans over 10 years, during which time she taught French, English and second/foreign language pedagogy in various contexts. She has worked in the public and private sectors, as a teacher and curriculum developer, in Japan and Canada, working with younger students (e.g., kindergarten, junior high school) and adults (e.g., university students, professionals). Her doctoral research explored how professional learning networks (PLNs) can support Canadian French as a second language (FSL) teachers to network, build community, develop their professional identity and foster leadership skills. At present, Mimi is the acting liaison officer for the Ottawa region with the OISE Alumni Association. Dr. Cindy Sinclair is President of the OISE Alumni Association (OISEAA), Mentor, Ambassador and Co-chair of the OISEAA Global Education and Fundraising Committees. She is an independent global education consultant and researcher focusing on national and international collaborative enrichment opportunities to support students’ learning and immigrant professionals’ integration in society and workplaces. 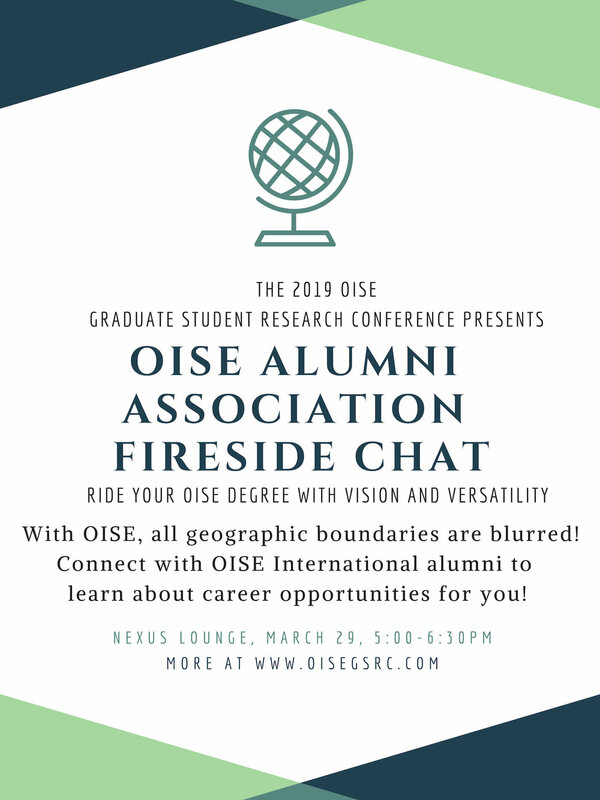 Cindy organized the first OISEAA/GSRC International Fireside Chat in April 2018. She is co-investigator of a pilot study on Multiliteracy Through Multimodal Communication involving Canadian and Ghanaian students and teachers. Prior to joining OISE as executive assistant to the Chair in 2008, Cindy worked in the Faculty of Medicine for 20 years. She received her MEd and PhD degrees from OISE/UT. Lems Leonie aka Nana Adwoa Bamfowaa, is a retired Canadian Educator, a Mentor and Humanitarian. She is a graduate of the University of Toronto and OISE/UT. In 2001 she was installed as the Nkosuohemaa (Development Queen Mother) for the Town of Asokore-Kuma under the stool name, Nana Adwoa Bamfowaa. In 2015, she founded NABCEF Foundation, whose Vision is to provide educational assistance to the less privileged in her community. She participated in the first International Fireside Chat in 2018. She is currently one of the co-investigators of the Multiliteracy Through Multimodal Communication pilot study. Nana presently resides in Koforidua, West Africa. She continues to contribute to the education of the youths in her community and actively serves as the OISEAA as the Global Network Chair for Ghana. Tingting Fan, BA, MEd (Jilin Province | China) Tingting Fan graduated from the OISE Developmental Psychology and Education program in APHD with a Master’s degree in 2017. She engaged in various volunteer services while studying in Toronto such as “Farm to Fork” Organic Food Festival, the Good Shepherd Ministries and Harvest Noon. She currently lives in Changchun City, Jilin Province in China and runs an educational organization program which is mainly aimed at teaching kids English based on applied psychology and English teaching pedagogy. She is an English teacher providing training programs for students at all ages and online TOFEL courses for ESL learners. Dr. Devi Dee Mucina is an Indigenous Ubuntu from the Ngoni, Chewa and Shona people of southern Africa. He is an Assistant Professor and the Graduate Advisor for the Indigenous Governance program at the University of Victoria, British Columbia. He received his PhD from the Ontario Institute for Studies in Education, Department of Sociology and Equity Studies in Education, University of Toronto. His academic interests are Indigenous African philosophies, decolonizing Indigenous Masculinities, and Indigenous fathering and other-fathering. Dr. Mandeep Kaur Mucina is an Assistant Professor in the School of Child and Youth care at the University of Victoria. Mandeep has worked in the human services sector as a child and youth worker and social worker for 20 years. During this time, she has worked as a child protection worker, violence against women counsellor and has been active in community engagement work with migrant families. Mandeep did her undergraduate degree in child and youth care and has a Master’s degree in Social Work from the University of Toronto and a PhD from the Ontario Institute for Studies in Education, Adult Education and Community Development Program. Serena Quintal is a current OISE MA student in Curriculum Teaching and Learning and Core French teacher with the Peel District School Board. Through her MA studies, Serena is exploring effective pedagogy that advocates for cultural and linguistic diversity in FSL programs. With the collaboration and support of OISE alumni, she is the lead investigator in a pilot study on Multiliteracy Through Multimodal Communication. This study was inspired by the first International Fireside Chat in April 2018. Serena has co-published two teaching resources that support teachers in creating multilingual classrooms which can be found at the OISE library (http://go.utlib.ca/cat/11999378). Dorian Stoilescu is lecturer since 2012 in the School of Education at the University of Western Sydney. He spent more than 20 years in research and teaching in Australia, Canada and Romania in mathematics education and computer studies in education. He received his PhD from the Ontario Institute for Studies in Education of the University of Toronto (OISE/UoT) from CTL in summer 2011. Currently, he is doing research and teaching courses in both primary and secondary programs in mathematics education, ICT education, research in education, and pedagogical practices.